Revised edition. 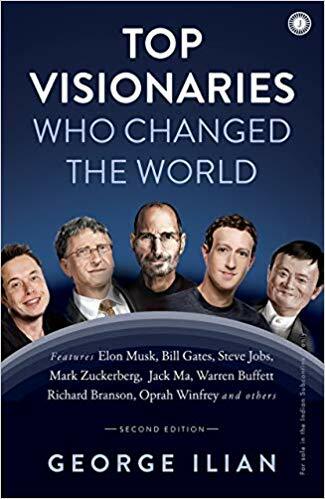 Features Elon Musk, Bill Gates, Steve Jobs, Mark Zuckerberg, Jack Ma, Warren Buffett, Richard Branson, Oprah Winfrey and others. What if you could sit down to dine with some of the world’s most successful entrepreneurs and have a conversation with them. What would you ask them. What insights would they give to you. Find inspiring life and business lessons from visionaries such as Steve Jobs, Mark Zuckerberg, Warren Buffett and Tony Robbins, Elon Musk and Oprah Winfrey. Without passion for what you are doing, you will not make it very far in your field. Read about success and failure from visionary leaders who have built some of the most valuable organizations of the world. Learn to think like a winner. George Ilian has made his mark on the digital industry, owning an e-book business among other endeavours. He is the author of 18 books in the genre of business and motivation. George aims to inspire people across the globe through models of the world’s most successful people in concise form. “We’re here to put a dent in the universe. Otherwise, why else even be here.”. —Steve Jobs.